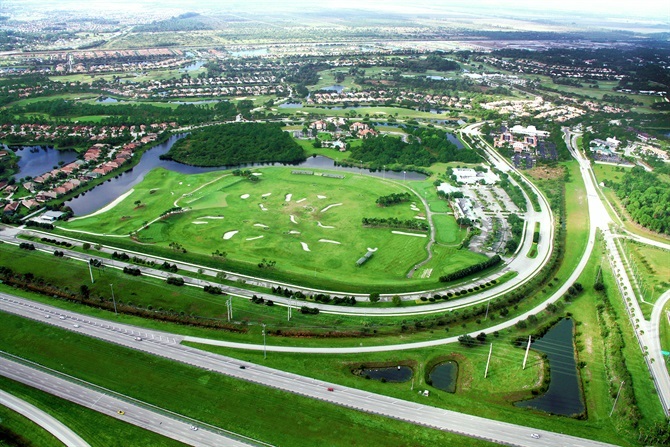 The PGA Learning Center is one of the most extensive golf practice facilities in the United States. The 35.8-acre facility features a large, circular driving range with portable shade structures, a 3-hole practice course, two large putting greens, a bunker complex and various instructional areas. The 8,200-square foot clubhouse includes a retail shop, video instruction and club fitting, club repair and fitness facility. The adjacent 7,200-square foot former golf museum is utilized as a conference center. An attractive aspect of the property is its redevelopment potential for commercial and/or residential uses. Owned and operated by the PGA of America, the Learning Center is situated just west of I-95 in the PGA Village.